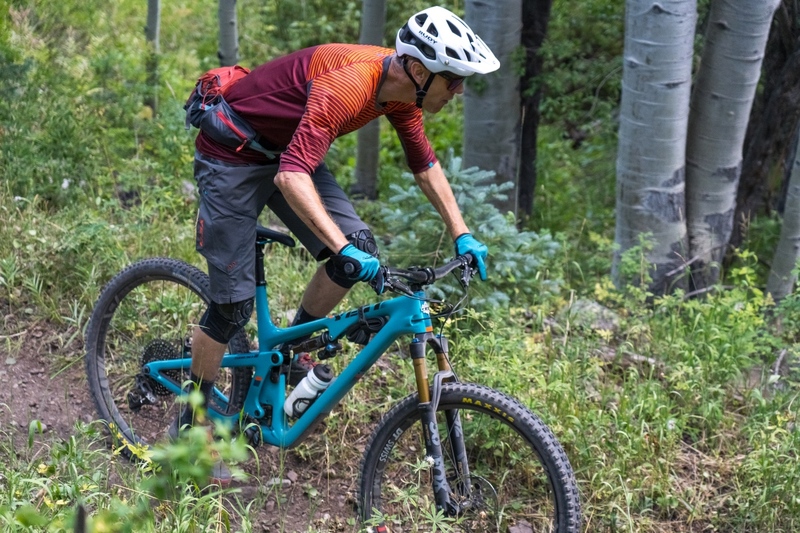 Following last month’s roll out of the enduro-racing ready SB150 comes the new Yeti SB130, which similar to its longer travel sibling, is an aggressive 29er that aims to remedy any shortcomings of the Golden, Colorado-based bike maker’s previous trail tamers, which basically means it’s another great bike that now has room inside the main triangle for a full size water bottle. 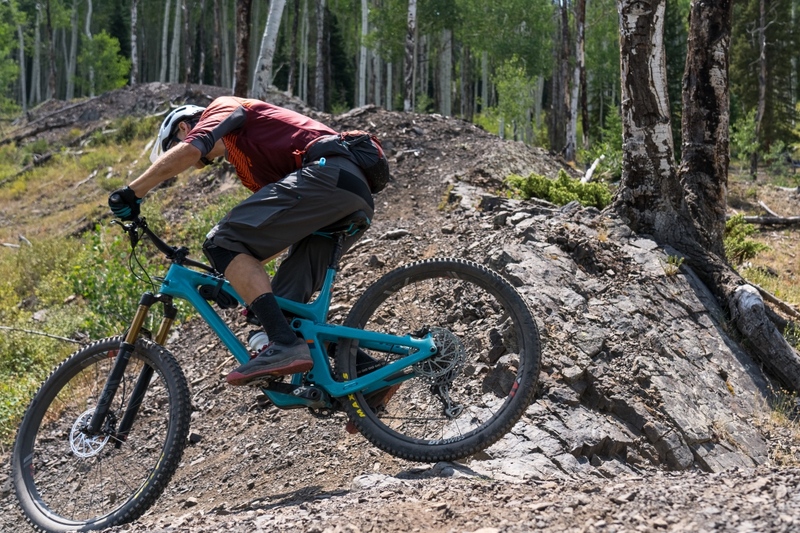 The Yeti SB130 does this while maintaining the exemplary performance of its highly regarded Switch Infinity suspension system that provides an efficient pedaling platform — and capably soaks up whatever you throw at it when headed downhill. 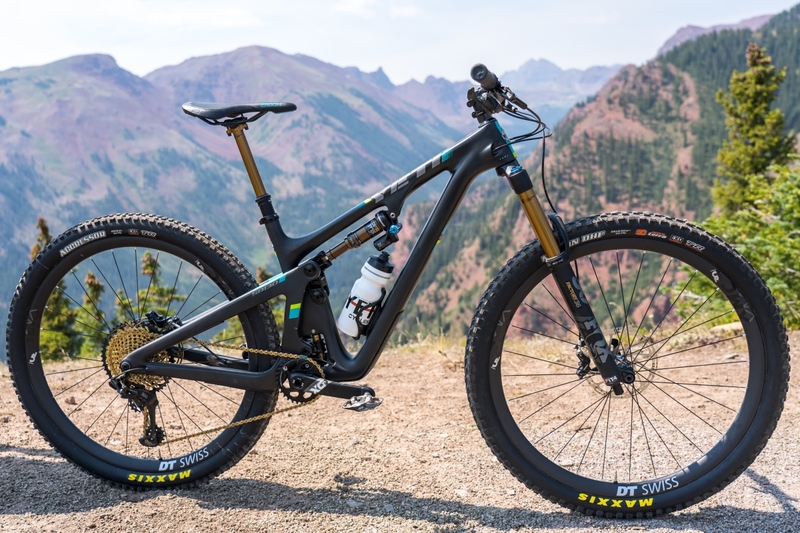 Key metrics of this wagon wheeled singletrack slayer include 130mm rear travel, 150mm up front, 65.5-degree head angle, 76.9 effective seat tube angle, 433mm chainstays, 44mm fork offset (versus the traditional 51mm), 480.2mm reach/797.2mm front center, and 1230.2mm wheelbase (all size large). 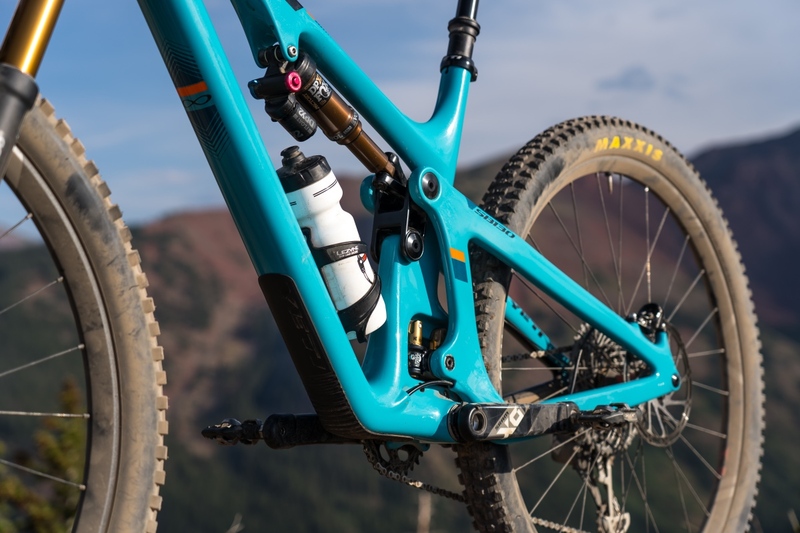 And like its longer travel SB150 sibling, the Yeti SB130 has a new patent-pending 60mm shock extender, and all hardware, aside from the link, is shared between the two models. 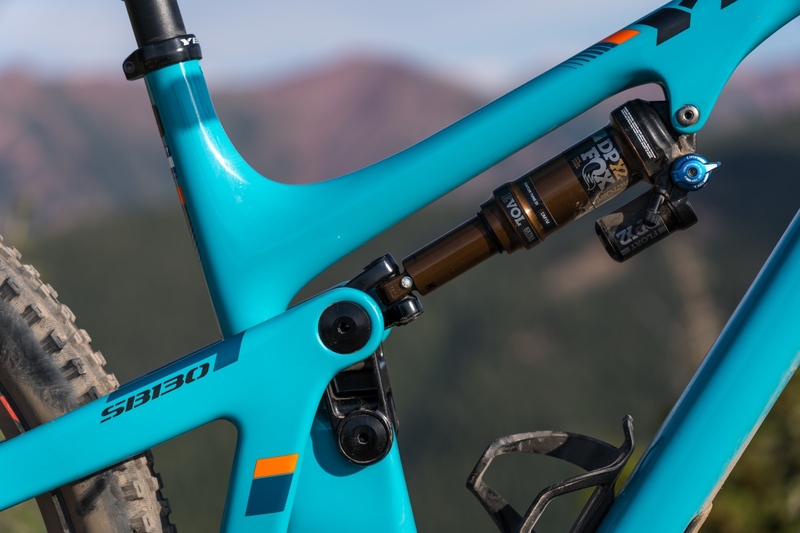 Like with the SB150, space for the water bottle on the Yeti SB130 frame was achieved by altering shock mounting placement, which on the Yeti SB130 attaches to the top tube (versus on the downtube on the outgoing Yeti SB4.5 and SB5.5). 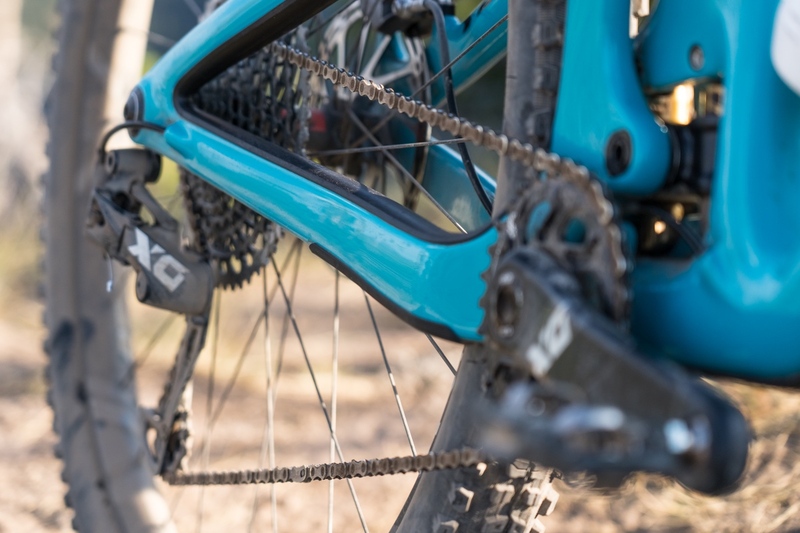 This change required use of the aforementioned shock extender, which Yeti designed with input from suspension provider Fox in order to assure that the bearing overlap ratio did not put too much load on the shock. The extender itself is a two-piece hinged component that allows you to remove/install your shock without need for disassembly. 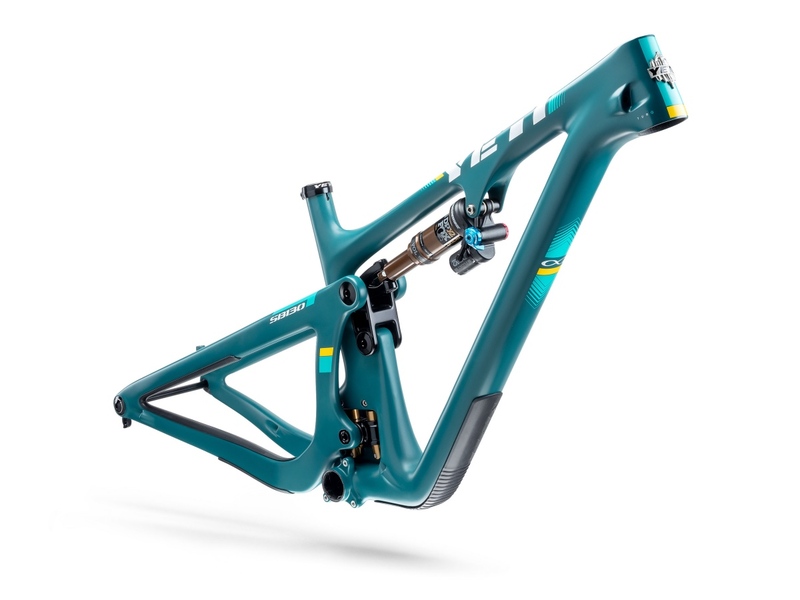 Other top line highlights of the new Yeti SB130 include a high modulus carbon fiber main frame and swing arm, 31.6 instead of 30.9 seat tube diameter meaning less required clamping force (and thus less friction in dropper post movement), integrated ISCG-05 mounts, tapered integrated headtube, downtube protector and chain guards, and internally molded carbon tube-in-tube inside the frame for truly hassle-free cable routing (and presumably no rattling). The new bike also has an integrated axle and derailleur hanger system, a nifty removable port under the pressfit BB to ease dropper post routing, and boost hub spacing front and rear. Reach was also dramatically lengthened. 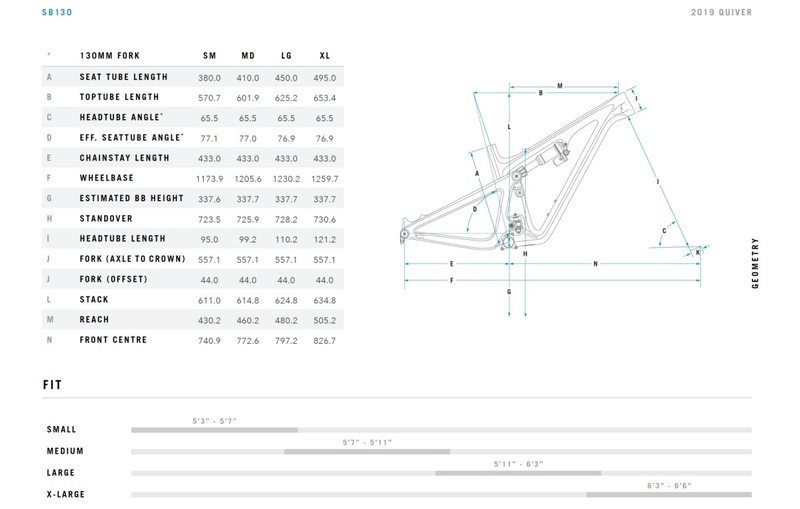 A size Large SB5.5 reach measured 442mm, while the new Yeti SB130 comes in at a touch over 480mm. And just like the SB150, the Yeti SB130’s fork offset dropped from the traditional 51mm to 44mm. 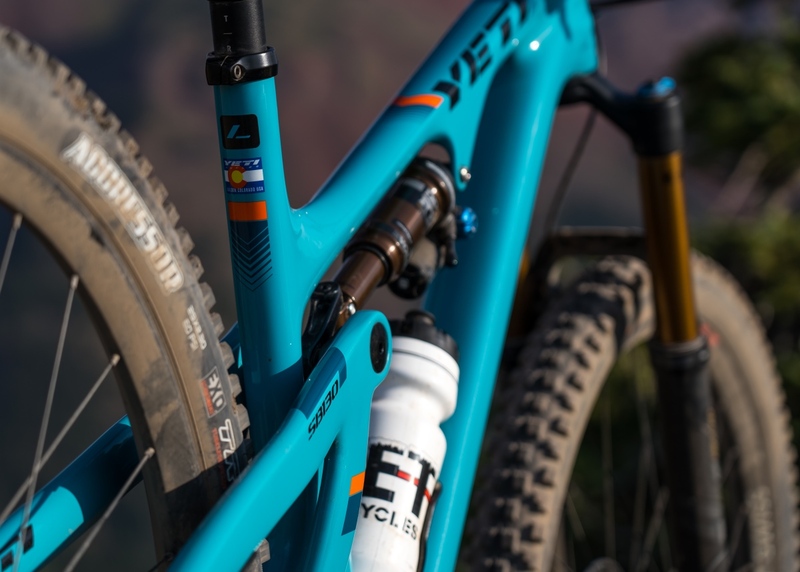 This change came thanks in part to the efforts of Transition, which convinced both Fox and RockShox to make forks with shorter offsets for their Sentinel 29er enduro bike. That allowed other bike makers the opportunity to experiment. Yeti did and liked the results. 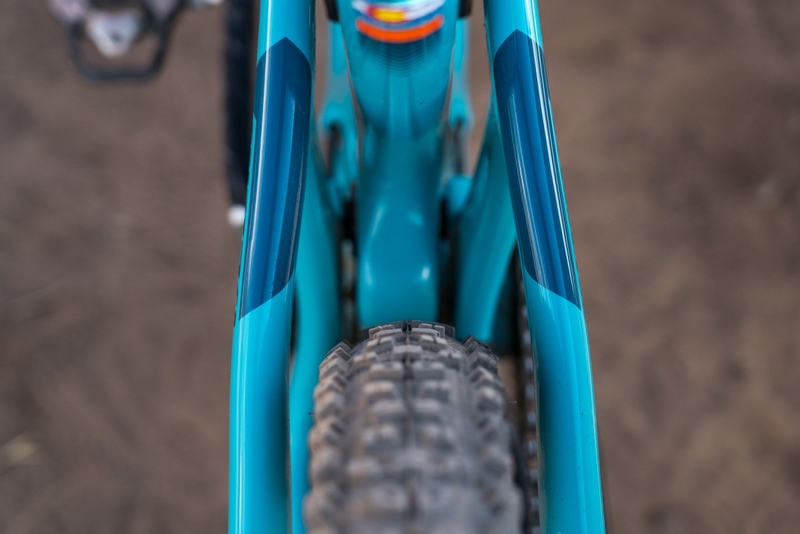 The general thinking is that as bike geometry has evolved (longer, slacker, lower), performance at slower speeds and on flatter terrain could be negatively impacted. The culprit, of course, is the front wheel, which has been pushed farther and farther away from the rider. But by reducing fork offset you bring the front axle rearward, moving the wheel back under the rider. Combine that with a shorter stem and you get better front wheel traction. Or so the thinking goes. 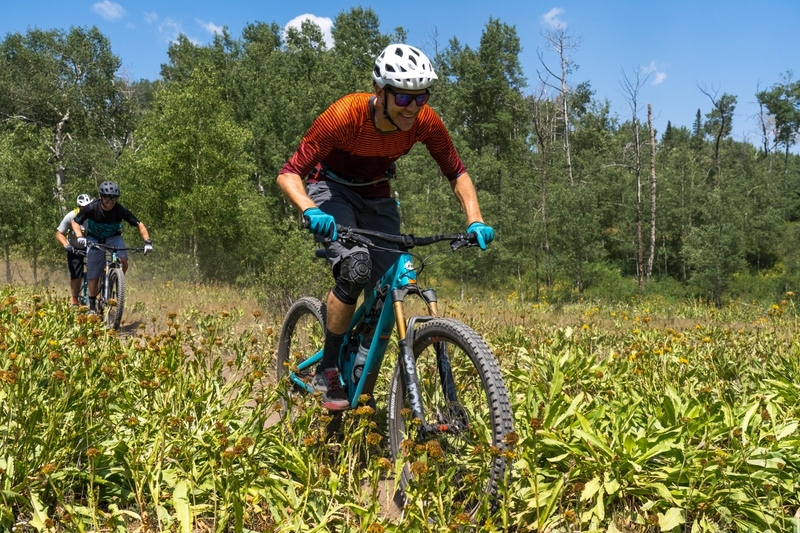 The potential drawback is that by shortening fork offset (and slackening head angle) you increase trail, which in turn means more steering input is required. This was definitely something we noticed when testing the longer travel SB150 (it needs to be pushed hard to truly perform as intended). 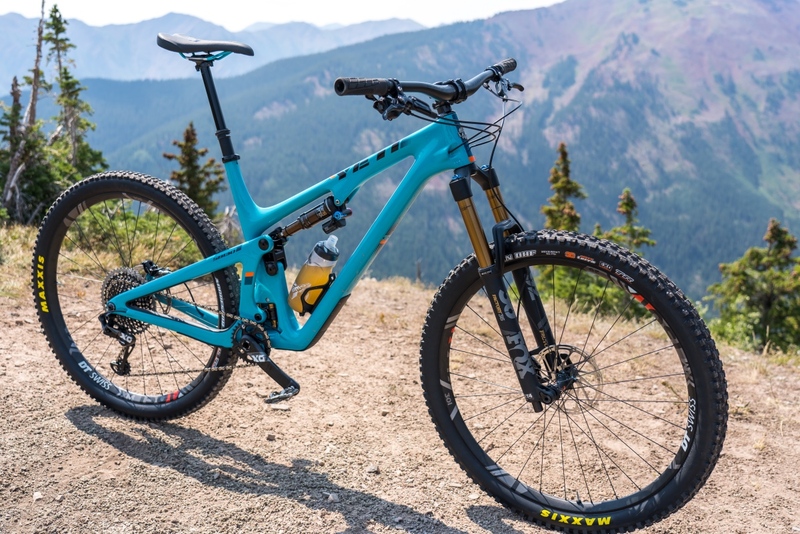 But the Yeti SB130 showed no ill effects of the fork offset change, and instead simply wowed us with its overall trail taming abilities (more on that below). The Yeti SB130 in turquoise. 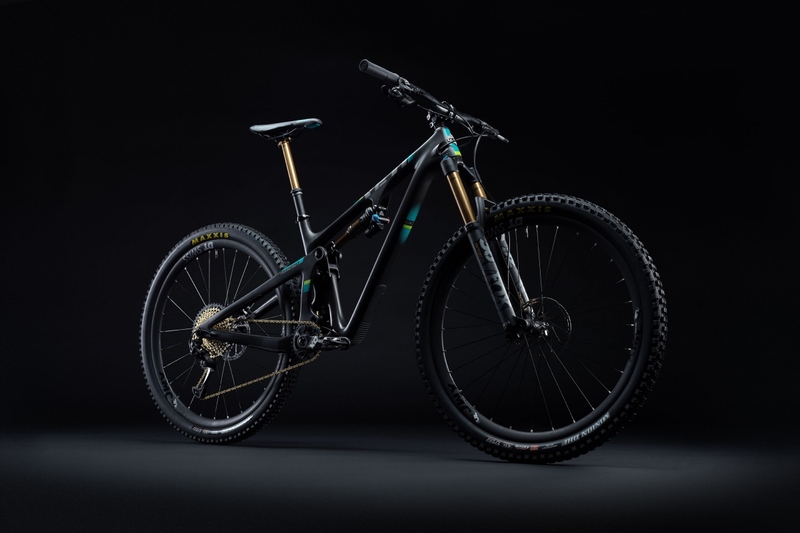 The Yeti SB130 in spruce. 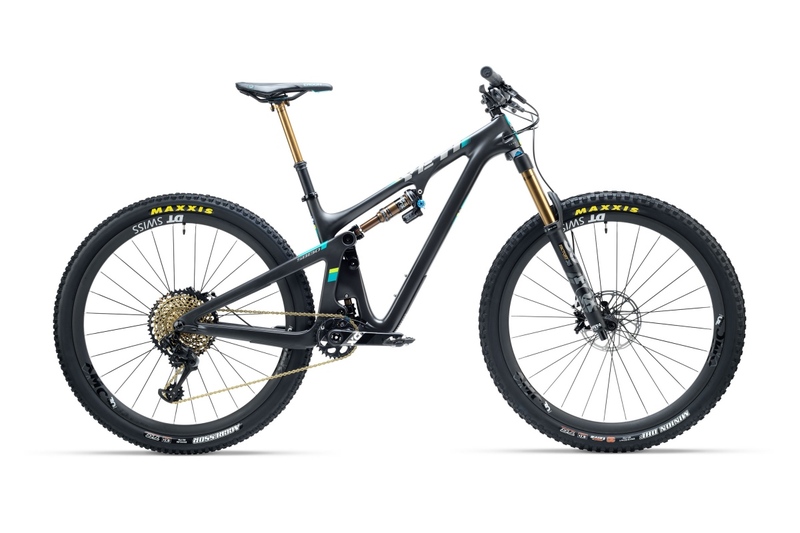 The Yeti SB130 in black. 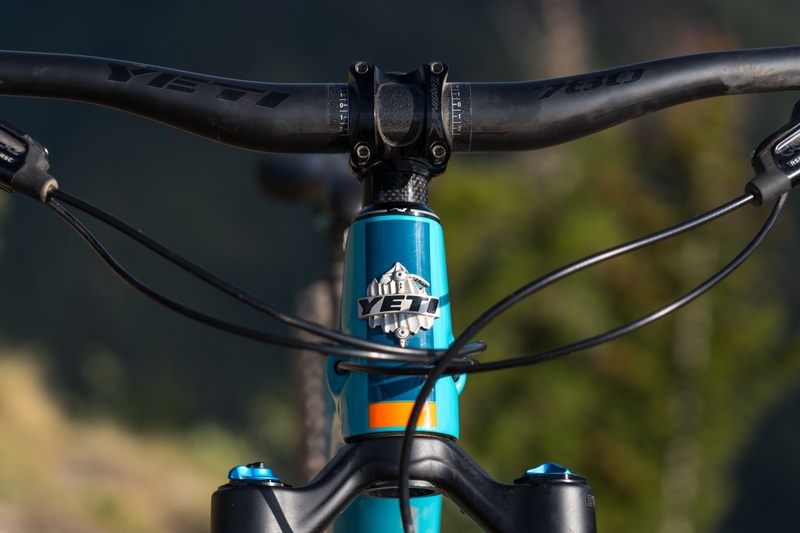 The other major Yeti SB130 headline is the tweaks to overall suspension kinematics, which now include a slightly more progressive leverage curve compared to the outgoing Yeti SB5.5 and SB4.5. This was done while still maintaining Switch Infinity’s efficient pedaling platform. As a quick refresher, Switch Infinity utilizes a patented translating pivot that switches direction as the bike moves through its travel. 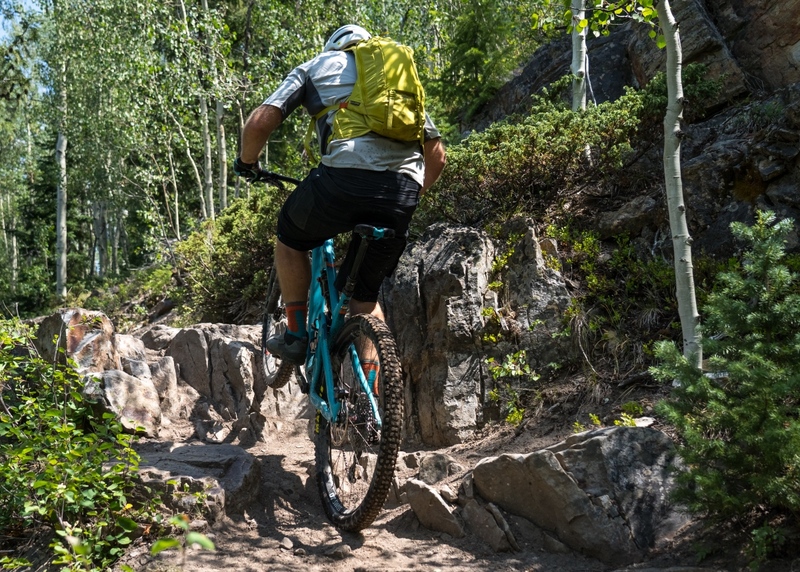 This provides excellent anti-squat characteristics for enhanced pedaling performance, solid mid-stroke support, and still maintains the desired bottomless and plush feel as the suspension gets deeper into the travel. 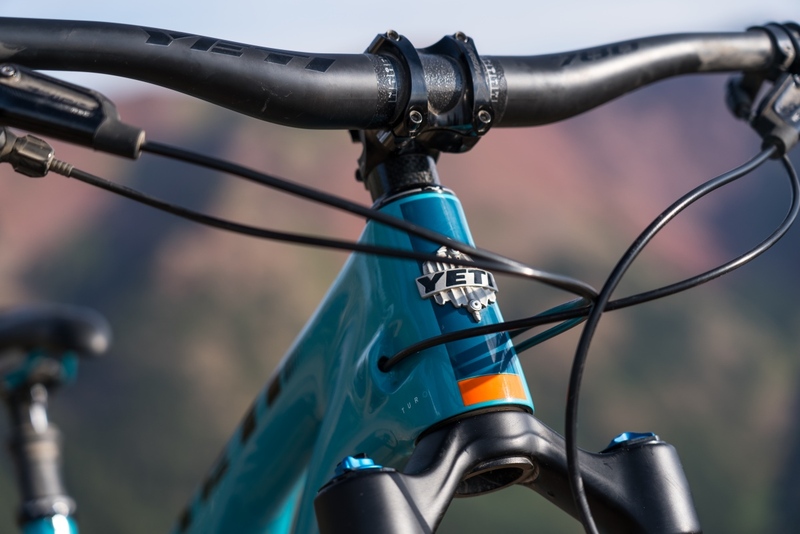 Yeti studied leverage ratios intently during the bike’s two-year development process that coincided with bringing the SB150 to market. Before they averaged a 5% leverage curve, but now they’re at 12% for the SB130 and 15% for the SB150. 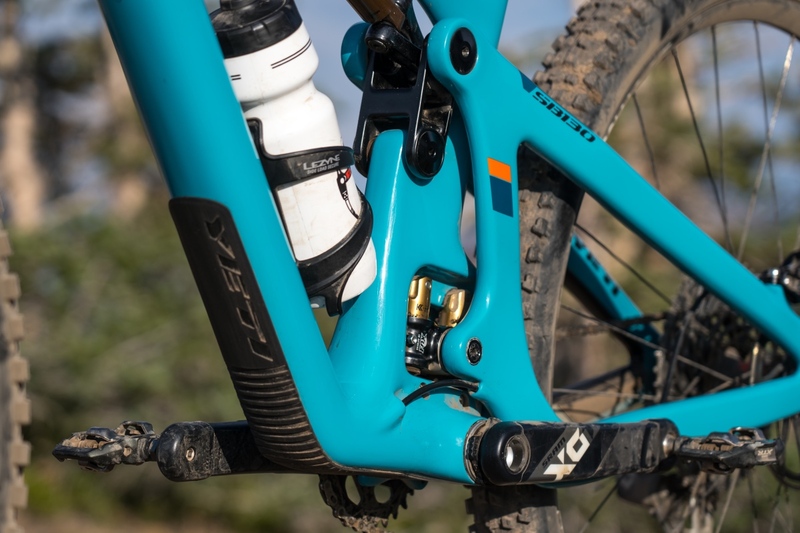 These new progression percentages give both bikes a wider range shock compatibility and tuning window (it’s less likely you’ll need volume spacers), while at the same time improving small-bump compliance and end stroke support. 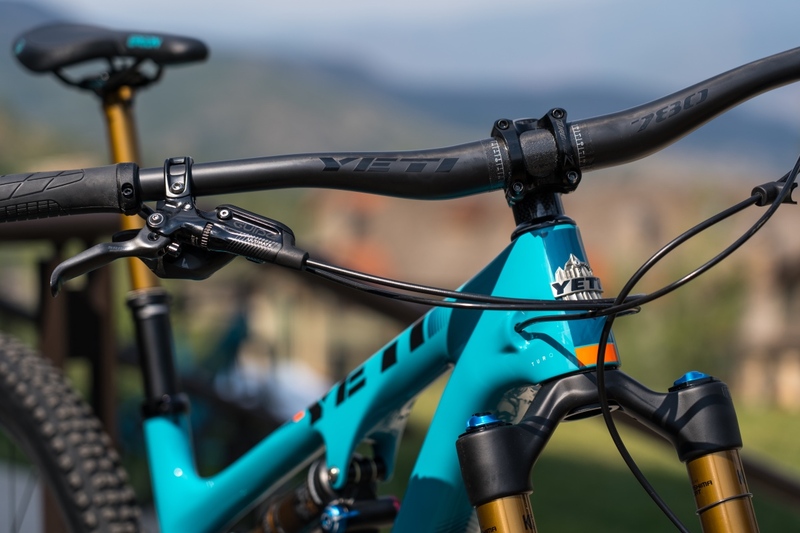 The Yeti SB130 comes in three frame colors (black, spruce, and their traditional turquoise), and two material options, standard C Series carbon and the more expensive Turq, which shaves 200-300 grams depending on frame size. 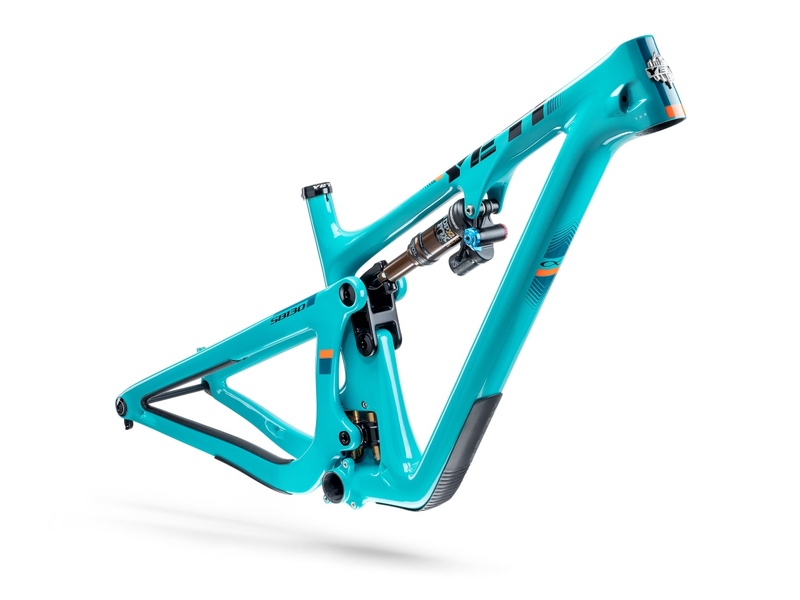 A Turq frame only runs $3500. 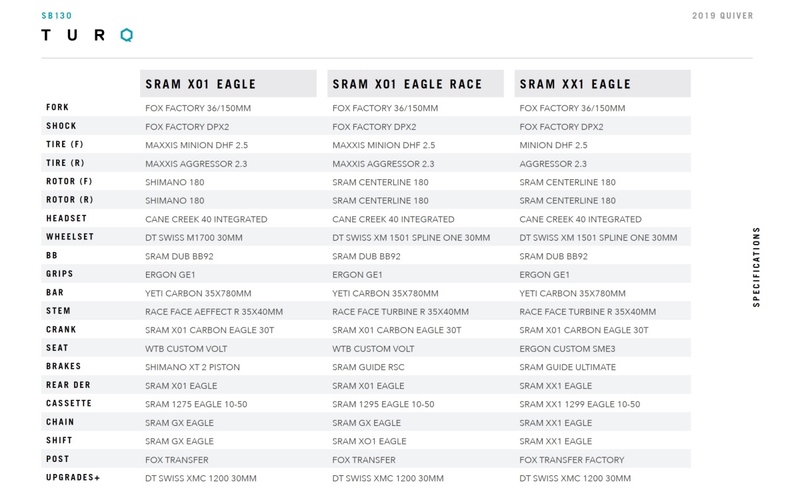 The two C Series builds are $5199 (SRAM GX Eagle) and $6199 (GX Comp Eagle). 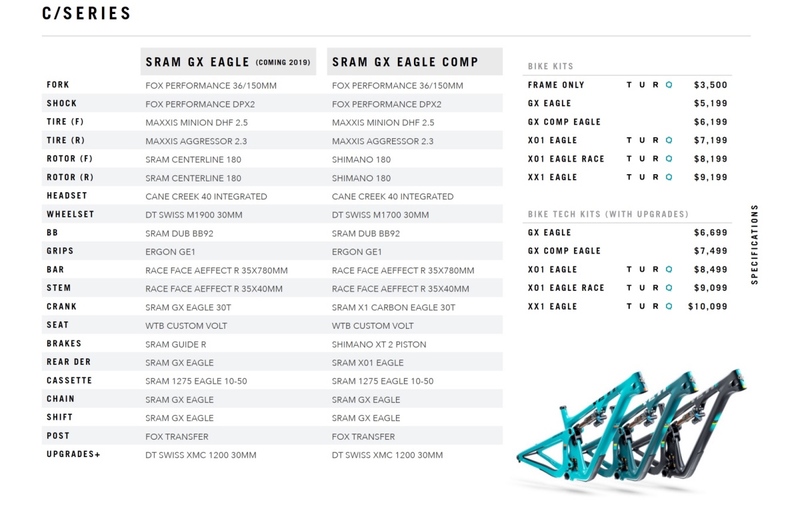 Price for the Turq complete bikes are $7199 (SRAM XO1 Eagle), $8199 (SRAM XO1 Eagle Race), and $9199 (SRAM XX1 Eagle). All five builds can be upgraded to DT Swiss carbon wheels for around $1000. 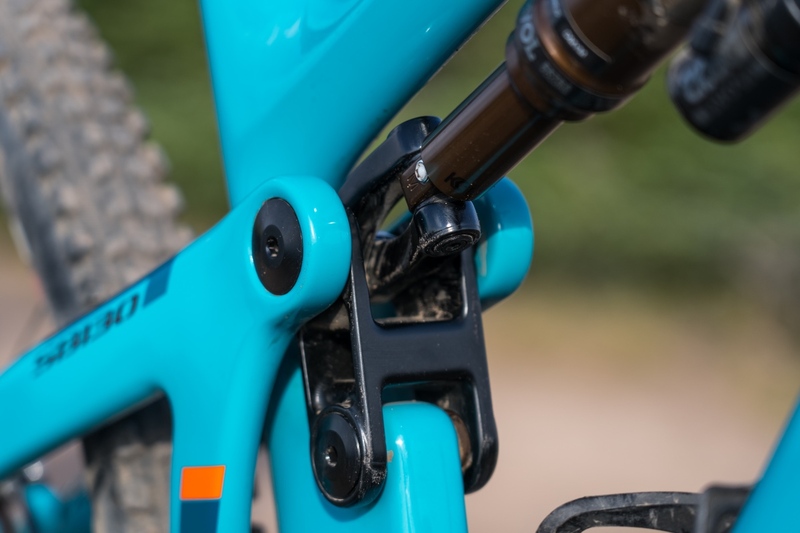 All 2019 (or newer) frames, including the Switch Infinity link, are covered for life against damage due to manufacturing defects for the original purchaser. Paint and finish are covered for 1-year. We will repair or replace, at our discretion, any frame we deem defective. 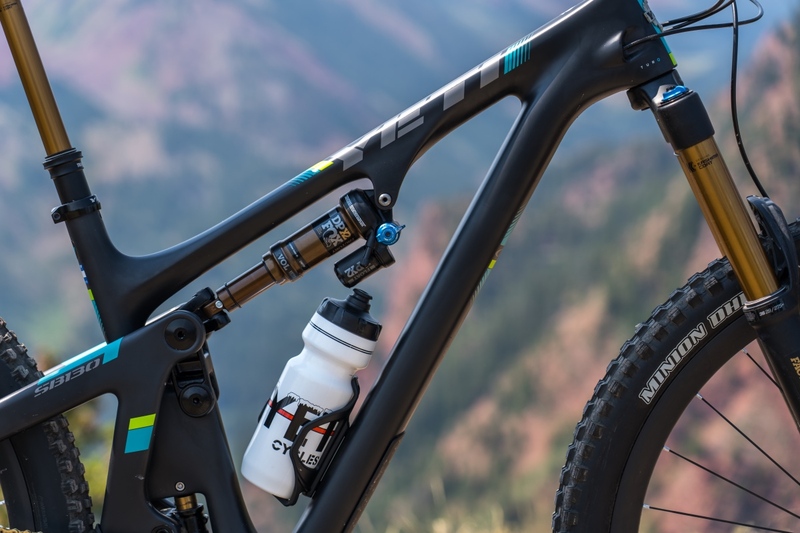 There are a few conditions: you must register it online at YetiCycles.com and you must take it to an authorized Yeti Cycles dealer for processing. Warranty does not cover damage due to ordinary wear and tear, neglect or intentional destruction. From a slingshot or your truck. Lifetime Warranty applies to all 2019 and newer frames (including the SB100). Model year 2018 and older frames will be covered under our previous warranty (5-year or 2-year based on time of purchase). Simple as that. No fine print. If you happen to have a crash or non-warranty situation, we’ll get you back on the trail with a reasonable replacement price. Same conditions as above. Here’s the complete geo chart and full build spec sheets with pricing. Click the image to enlarge and keep reading to find what we thought of the Yeti SB130. 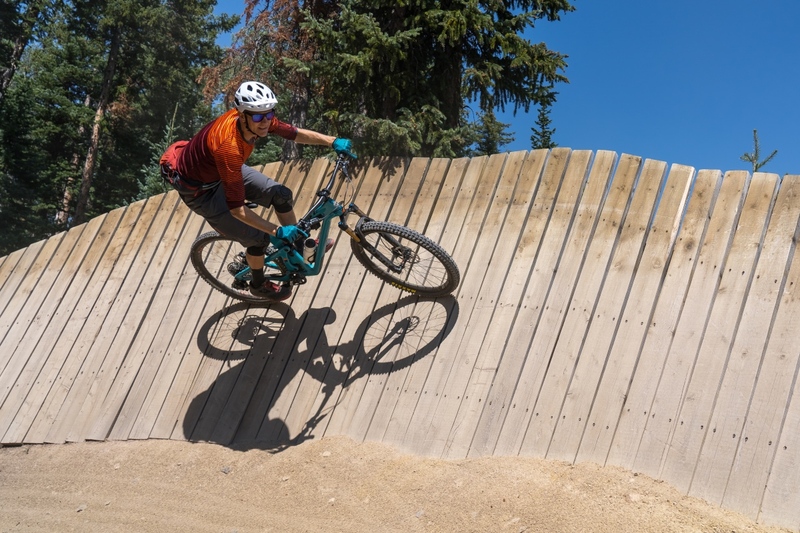 Mtbr has spent about 6 weeks testing an XL-size Yeti SB130 with SRAM XO1 Eagle Race build on everything from mellow high desert singletrack, to rough backcountry chunk, to the expert-rated bike park trails at both Aspen-Snowmass and our home hill, Crested Butte Mountain Resort’s Evolution Bike Park. Our test bike set up tubeless weighs a respectable 29.2 pounds, and features Fox Factory DPX2 shock, 150mm Fox Factory 36 fork, SRAM Guide RSC brakes, DT Swiss XM 1501 Spline One aluminum wheels with 30mm inner rim width, Maxxis Aggressor 2.3 (rear) and Minion DHF 2.5 (front) tires, 35x780mm Yeti-branded carbon bars, 40mm Race Face Aeffect stem, and a 150mm travel internally routed Fox Transfer dropper post. As for the bottom line, I’m going to cut to the chase here. For where I ride and how I ride, I honestly have a hard time envisioning a better bike than the Yeti SB130. Thus the 5 out of 5 rating below. It climbs exceptionally well for a 130mm travel bike — or any bike for that matter. And it’s got enough brawn to handle just about everything I’ve thrown at it going downhill. 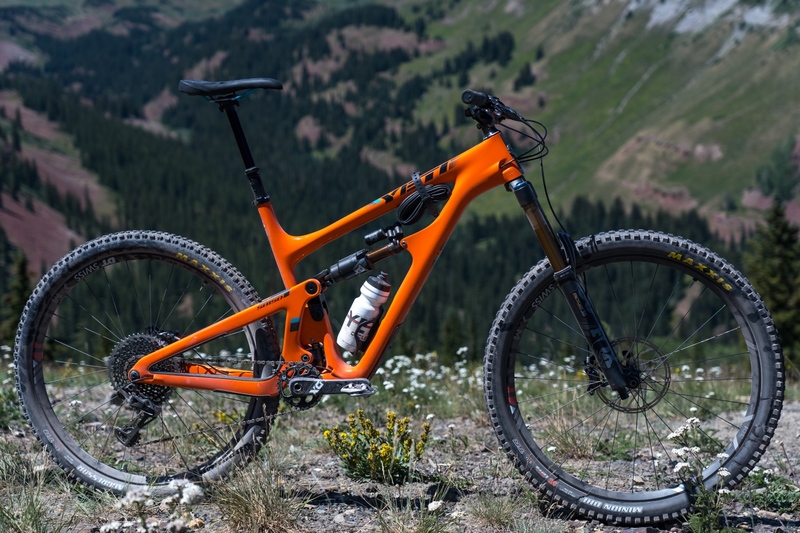 No, this is probably not your next enduro race bike or XC whippet. But that’s not what most of us are looking for. What we’re after is a bike that plays nice with gravity going up or down — and the Yeti SB130 is that kind of bike. 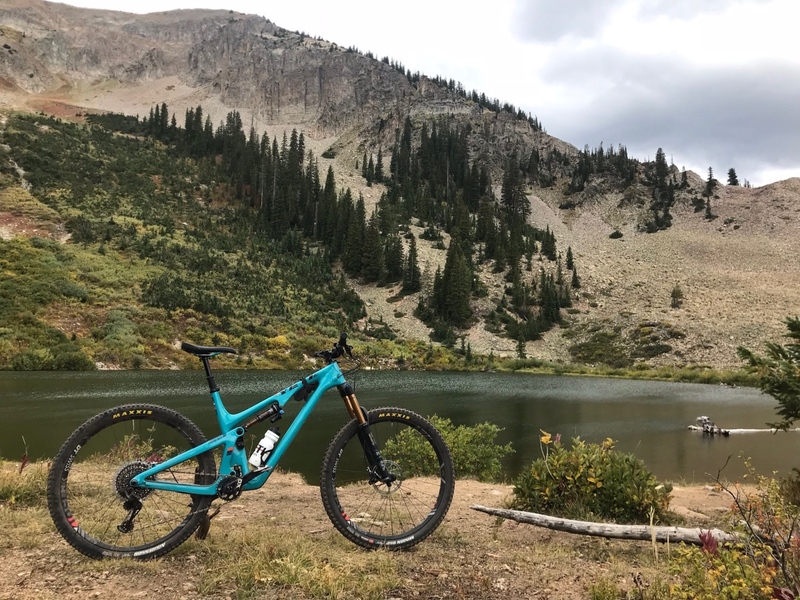 Remember the Green Lake trail that served as proving ground for the Yeti SB150 review here, and had that climb I’d never cleared. Well, I cleared it on the Yeti SB130 and honestly it didn’t seem that hard. The combination of exceptionally dialed geometry (seat tube angle makes such a huge difference) and superbly stable pedaling platform (Switch Infinity is the real deal), allow for clean and efficient climbing, while still staying supple enough to maintain traction through choppy terrain. And not surprisingly the SB130 is a touch more precise and nimble than the SB150 thanks largely to its slightly steeper head angle (65.5 versus 64.5) and shorter wheelbase (1230.2mm for an L versus the SB150’s 1248mm). The other thing that really stood out about this bike is how intuitive it is to ride. Typically it takes me a handful of outings to get comfortable on a new bike. 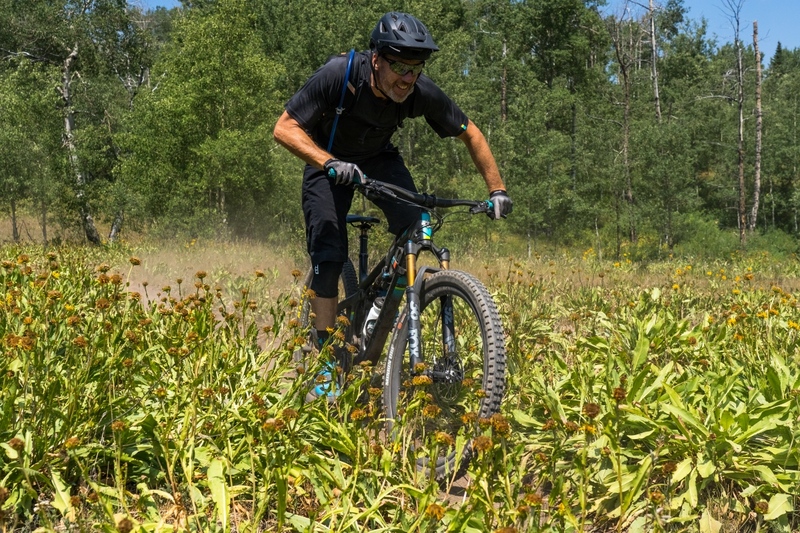 But the Yeti SB130 immediately felt like an old friend, slashing precisely through turns with minimal steering input, dancing through (or over) chunder, and easily clawing up chunky ascents. My only really quibbles are price ($3500 is a lot of cash for just frame and shock), and some of the spec. While a great rolling tire with decent grip, I managed to flat the rear 2.3 Maxxis Aggressor twice (both times before I added more compression damping). If this bike were mine, I’d swap on something a little more robust. Same goes for the stock 150mm travel dropper post; 170mm would be a better option. And yes, I wish the SB130 was a tad lighter, a problem I’d address with a carbon wheel upgrade, budget permitting. 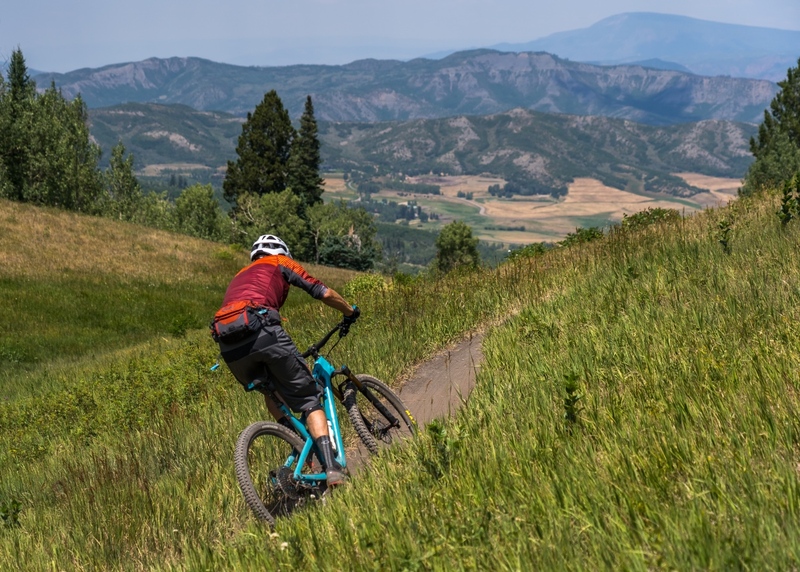 But honestly, if your ride objectives lean toward being able to go up and down without significant (or really any) compromise, you owe it to yourself to test drive this bike. It’s that good. Ride bikes, go places like this. That’s what it’s all about. Hi, very nice written review. One question, given the fact that you have mentioned tire issues. What rear tire (preferably Maxxis) would you use or find best for general trail riding (hardpack, medium-loose, occasional soft or occasional-seldom mud), in respect to size, grip, rolling resistance and weight (for a 30 ID rim)? Thank you! I actually really like the Aggressor for a trail bike rear tire. Rolls really well, good all-around grip. But I’d opt for the 2.5 WT and even consider the double down casing model, as I’d rather pay a weight penalty than worry about fixing flats. Thank you so much for the useful piece of advice! 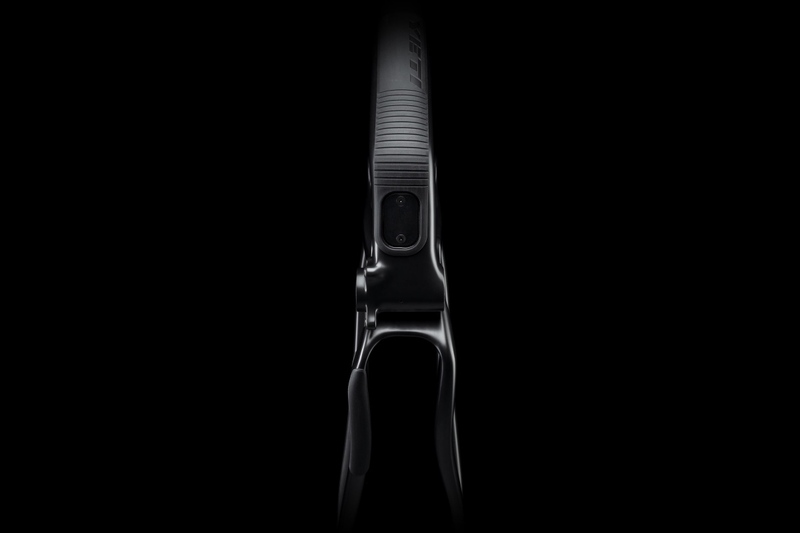 Try a Bontrager SE4 29 x 2.4. Great all-rounder, pedals well, V. good climbing & corner, and super tough. You’re welcome. Nice review Jason. Sounds about perfect. Thanks, Kent. Really is one of the best bikes I’ve thrown a leg over. The Aggressors do not hold up at all. For some reason they constantly flat for myself and everyone I know. The Minion SS/DHR/DHF all work great and it should be the same casing, but I haven’t gotten one to last past 50 miles yet and refuse to run them now. The Aggressor in DD carcass holds up exceptionally well, and, I myself am able to run it as low as 13psi for very nice dampning and grip. The DD Agressor is the way to go. As for the Yeti : Me thinks I’ll stick with my Wreckoning. Best handling bike I’ve ever owned. 13psi?! Haha! Okay! You must just ride in a straight line on pavement smooth trails. I would hit the rim doing a simple manual with 13psi and I weigh 165lbs. Your comment is a great reminder to consider the source when reading Internet opinion. in the past 30yrs bike technology has increase multi-fold. But the fact remains that only 10% of bikers use this technology, the rest are throwing their money away! Technology does not equal skill, hence, a rigid single speed skilled rider can smoke 90% of bikers on full-suspensions! Would have demo’d this if available a month ago, but enjoying my Ibis Ripmo. I’m just a shade under 6’4″ — XL fit great.